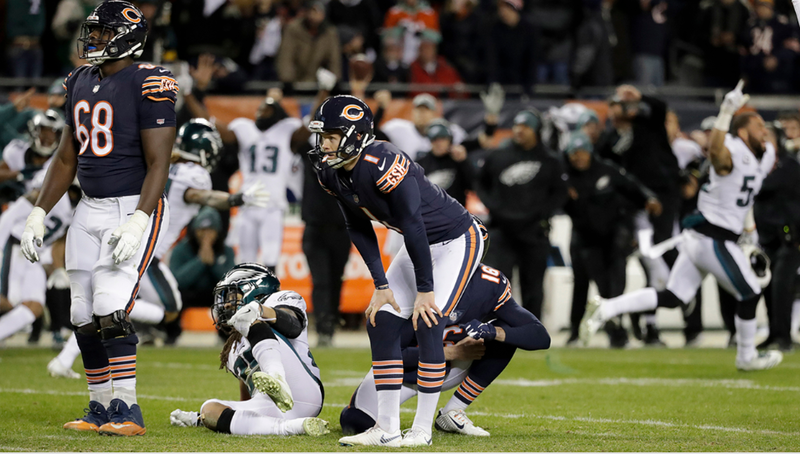 In the final seconds of Sunday night’s Wild Card playoff game at Soldier Field between the Bears and the Eagles, Bears kicker Cody Parkey had the chance to make a 43-yard field goal. The stage was set; make it, and the Bears would take the lead with less than 10 seconds to play. This one play would almost certainly decide the winner. What happened next was – depending on your allegiances – either a miracle, or a horror show played out in agonising slow motion. The intrigue started almost immediately. Right after the kick left Parkey’s boot, the Eagles’ Treyvon Hester seems to clip the ball with an outstretched hand, diverting it off its path. Blocked? Game over? Not yet. Defiantly, the ball didn’t drop short, instead it veered off to the left and clanged into the upright. Not finished yet, the ball – a weird, pointy oblong designed to bounce wildly and unpredictably at all times – instead dropped, almost impossibly, perfectly vertically, directly on to the crossbar below it. Finally satisfied, the ball takes a decisive carom. Let’s Talk About Kickers For a Minute, Shall We? Unlike the hushed-toned seriousness with which regular football drama is remembered, kicker-centric heartbreak is often viewed as a comic curiosity. As this moment goes down in history, even its name; The Double Doink, evokes more the raised-eyebrow “Ooh, er missus” of a Carry On film than of a tragically unlucky end to a team’s playoff hopes. Despite so often holding the fate of a team in their hands, kickers have always been viewed as a kind of other, as football’s outsiders. Rarely do they inspire respect, and even more rarely any loyalty from their fanbases. They are so often expendable – they have one job to do, and if they do it wrong… well, there’s always someone else. If Parkey had made the kick, the Bears would have won. He didn’t, and they lost. So, is it his fault that they lost? Bears fans will say yes, because blaming a journeyman kicker is much easier than coming to terms with an Offense that could only put the ball in the endzone once all game, or a vaunted Defense that couldn’t stop a backup QB when it mattered most. A job as an NFL kicker might be the least secure employment on the planet. At any one time, there are precisely 32 job openings as – the pseudo-employment of life on Injured Reserve notwithstanding – no team ever carries two kickers on their roster. With so few opportunities, the bar for entry is incomparably high. In the 2018 season, a total of 54 rookie wide receivers saw at least one pass thrown their way. At Quarterback, arguably the most competitive position in any sport, 10 rookies were given a chance under center during the regular season. That number for kickers is just 6, and that includes 29-year-old “rookie” CFL veteran Brett Maher. With competition for spots so fierce, the margin for error is razor thin. Once you’re in, you have to hit the ground running. The learning curve is vertical, and teams have no patience for growing pains. The Minnesota Vikings spent a 5th round pick on kicker Daniel Carlson. In Week 2, he missed all 3 of his field goal attempts. He was cut the next day. If your college nickname is ‘Mr. Perfect’, fans will take even less kindly to mistakes. So, when the Bucs spent a 2nd round pick on Roberto Aguayo in 2016, they immediately set the expectations sky-high for the rookie. Whether it was from the weight of this expectation or just bad luck, Aguayo stumbled out of the gates, missing 2 short field goals and an extra point in his first 3 games. The draft capital Tampa had invested in him likely saved his job, but the noise around Aguayo grew into a fever pitch. He was labelled a bust less than a month into his career, and it seemed to get into his head. He finished the year 22-of-31 on field goals – a not-catastrophic 71% – but his dismal mark of 4-of-11 from 40+ yards was too much for the Bucs to forgive. They cut their losses after one season. He will most likely never kick professionally again. Gosh, look at the time, we’ve gone off track. You already know how this story ends, and so do I, but Cody’s still out there waiting for us to finish. He’s been ever so patient. Time to check back in at Soldier Field. Parkey’s career field goal % from 40-49 yards out is just below 70%, which is well below par for an NFL kicker, but he’s 3-of-3 in the game so far. 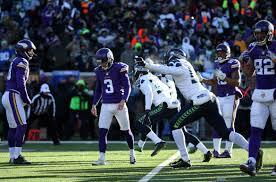 While eminently makeable, 43 yards is far from a guarantee, and when you take into account the circumstance, the odds of this kick going through rest on a knife edge. Kicking a game winning field goal is a lot of pressure. Doing it in a playoff game is an unbelievable amount of pressure. When missing probably comes with the added side effect of you getting fired, multiply that feeling by a million. Add on top of that the weight of expectation from all your teammates, all the fans in the stadium, and the millions of eyes watching on TV. Add the desperation tip of the ball by Hester and suddenly the scales tip in the wrong direction. The ball hits the upright, then the crossbar. Your whole team is at the mercy of the next bounce. It bounces out. Cody Parkey stops and stares at the turf in disbelief. It might be the last time he ever sets foot on it.